Mention Barbury, and like as not, your first thought will be that it’s home to leading Jumps trainer Alan King. And you’d be right. Alan’s successful yard nestles behind the Point-to-Point course that recently saw some hopeful Cheltenham calibre contenders of the future at the International Point-to-Point fixture in January. But there’s more than one King of this particular castle, and sitting atop the hill just over the ridge is another. Neil King, who moved from St Gatien Stables in Newmarket to take on Jim Old’s historic yard at Burderop in 2012, is emerging as a force to be reckoned with in staying races, thanks to the exploits of Lil Rockerfeller and Milansbar. King, enjoying his best season for several years, has been gradually improving the quality of his stock and standard bearers Lil Rockerfeller, who nearly pulled off a 33/1 shock in last year’s Stayers Hurdle when landing overt the last in front of Nicholls Canyon, and Milansbar, winner of this January’s Warwick Classic Chase, have been doing the stable proud. For a stable of modest size, running two horses rated around 150 or above offers a spotlight that is much coveted among the training fraternity. And if you’re seeking Cheltenham betting odds, then it certainly pays to follow horses from less fashionable stables. Neil is a countryman through and through. Brought up in a farming family near Bury St Edmunds, Neil cut his teeth riding in Point-to-Points before a year at agricultural college and a couple of years as pupil assistant to Nicky Henderson. He left there to build a training and livery yard, as many in the Point-to-Point circuit do, in order to build a solid grounding in horse care and training. In 2002, he took the plunge and purchased St Gatien Stables in Newmarket to take out a full licence. Over 12 years, he sent out 180 winners, but the switch to Barbury has shown a marked upping of the game. Now with nearly 250 winners under their belt, Neil and his wife Claire are making their mark and playing a full part in the success story that is Barbury. At the turn of the century, Wroughton was a very important training centre. Famed dual purpose trainer Ivor Anthony trained from the centre of Wroughton, and is of course best known for the best stayer of his generation – Brown Jack. But the area around the Barbury estate now houses a legion of established and up-and-coming talent, including Alan and Neil King, Emma Lavelle in nearby Ogbourne Maizey, and on the flat, Martyn Meade and Brian Meehan at the famous Manton Estate. To any racing fan then, this is racing heaven. And Neil King is out to embellish Barbury’s racing heritage, led by his two flagbearers for the season to date. “Lil Rockerfeller is a wonderfully consistent horse and always gives his all,” reports Neil. “He ran a peachy race in the Coral Hurdle at Ascot in late November, but he acts better on good ground. He ran an excellent race in the National Spirit at Fontwell and is still on course for -the Stayers’. Lil Rockerfeller has been such a great servant.” At best-priced 25/1 for the Stayers, he represents great value surely. Milansbar is another flying the flag for the yard that sent out Collier Bay to win the Champion Hurdle. 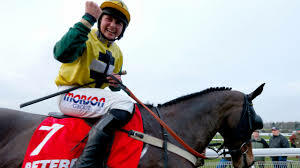 This year’s conditional find, Bryony Frost, took the mount at Warwick in January for the £75,000 Classic Chase, and exerted her magic with a pillar to post front-running effort. Prior to that effort, Milansbar had been positively mulish in the Welsh National, but blinkers and a female touch changed all that for the better. “Two Bs – Bryony and blinkers – have helped put the zest back into Milansbar. The National is the goal, but it’s one race at a time in this game,” adds Neil. Of one thing you can be sure. Even if the races are won one at a time, this king of Barbury will be on his throne for a long time yet.